The Attacks of 26/11 is based on the tragic terrorist attacks which transpired in Mumbai back in 2008. Directed by the legendary Ram Gopal Varma, the film stars Nana Patekar, Sanjeev Jaiswal, Ganesh Yadav and Atul Kulkarni in key roles. It is schedules to release in cinemas worldwide on 1 March 2013. Reportedly, the film’s 7 minute preview has crossed a whopping 1 million views on YouTube, proving that it has potential to do very well at the box office upon release. The music has been composed by an extraordinary 5 music directors, who include Sukhwinder Singh, Rooshin Dalal, Kaizad Gherda, Amar Mohile, Vishal Khosla and Sushil Khosla. The lyrics have been written by Kalgi Thakar, Rashid Iqbal, Liaqat Jafri. So let’s take a look and see what the soundtrack to this much anticipated film has to offer. The first track is Antake Aaye, which is sung by Jaspreet Jazz. It contains intense rock music which is flavoursome and has been brilliantly composed. I very much enjoyed the way in which the electric guitar was executed here and adds to its overall appeal. I love Jaspreet’s vocal performance and he was no doubt the perfect singer for this particular song. Hence, definitely give it a listen! Following this we have Maula Maula, which is performed by Sukhwinder Singh and Rooshin Dalal. I consider this song to be fantastic for a number of reasons. For one, the music is energetic, rhythmic and contains a blend of appropriate Indian instruments. Secondly, Sukhwinder’s voice was just incredible to hear and he really gave it his all. I rarely hear songs of this particular type in Bollywood soundtracks so I recommend that you do not miss out on this one as it is truly an amazing and powerful song. Next up there is Khoon Kharaba Tabaahi, which is sung by Suraj Jagan. Although the vocals by enjoyable to listen to, I thought the composition was average. It just doesn’t have that catch that will grab your attention. However, it may be possible that this song will pick up once everyone has seen the picturisation to it when the film releases. If you do decide to give this one a listen, then do so simply for Suraj’s great voice. Finally we have Raghupati Raghav Rajaram. The first version is performed by Sanahmoidutty, Anita Sridharan and Bornalee Deuri. This is quite an odd version of the classic devotional song. I felt this one was not as superb compared to the other versions I have heard in the past, which includes the version that was used in the super hit film Kuch Kuch Hota Hai (1998). However, I did enjoy the second version more which was sung by Sukhwinder Singh. I had a better rhythm and feel to it which I felt was well co-ordinated by the music director. Thus, I recommend that you hear the second version since it contains more emotion which will have a greater impact on you. To sum up, I found the music to The Attacks of 26/11 to be both refreshing and unconventional compared to what we regularly hear in Bollywood today. Though the album itself is a little short, I feel that a good amount of effort has been put into this soundtrack and hopefully it will grow in popularity. 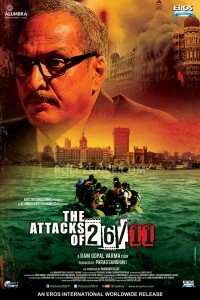 If you are keen on experimenting with Bollywood music, then definitely do give The Attacks of 26/11 a listen. Trust us, you won’t be disappointed! 17 queries in 0.519 seconds.